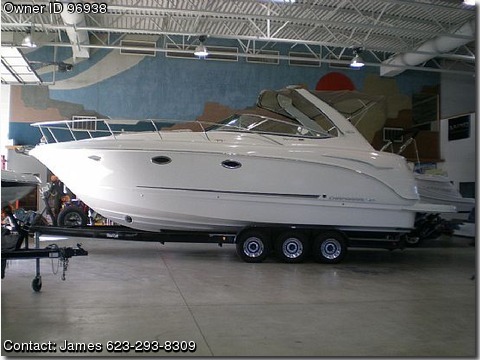 Please contact the owner directly @623-293-8309 or jcampbell3201@hotmail.com…2008 Chaparral Signature 330. This boat was a demo boat. 375 hp engines and Bravo three outdrives with only 92 hours on them. btu acheat and a water heater. A 26&quot; HD tv and a 17 &quot; tv in the private aft cabin. cabin is upgraded with an electric dinette table and teak flooring. and tweeters all powered by Rockford Fosgate amps costing 7000.
interior decor is the Cabana package offered by Chaparral. offers an E 80 Ray marine gpschart plotter and a shipshore radio. also has a refrigerator and a sinkbar and an aluminum arch. seating and a beautiful aft table with seating for 6.
with a full cabin enclosure and a cockpit cover. batteries replaced and added a third for the stereo.